Let’s do a little experiment...if you got to my post here on 1Wayswim via Facebook press the “like” button on Facebook. I have 58 people following 1Wayswim on Facebook and I’m willing to bet only a handful of those 58 people will actually see this article in their feed. About a week ago GeekDad published an article informing all of our readers on how to continue to get GeekDad and GeekMom content...outside of Facebook. Why? Because Facebook has made a change to its algorithms that create each of your Facebook feeds. Yes, there is a Facebook computer that decides for you which item goes into your feed and which items do not. For now, Facebook has only made this change in 6 markets across the globe and this is only a test. But this brought up a really important point to a lot of content publishers...Facebook can do anything it wants with its own site. Makes sense. But keep that in mind, Facebook is a service and you are not the customer but rather you are product. Facebook makes a lot of money by serving you ads. So your Facebook feed is not something you have complete control over, Facebook ultimately decides what you see and what you don’t see. If Facebook is literally your only window into the internet then you may not have much of a choice but to just accept this. But if you are a little more internet savy there are a lot better options out there for you to get the published content you want to read. Subscribe by email: I use a Google service called Feedburner that takes each new article I post and turns it into an email that is sent your inbox. All you have to do is click on the “Subscribe” button on the front page of my website and then enter in your email address into the “Subscribe by email” section of that page. I don’t do anything with your email address, so don’t worry you won’t get any spam from me. Apple News: Each new article I post on 1Wayswim is also published on Apple’s “News” service. If you own an Apple device then you have this app. It’s actually a really great way to get a variety of news content all in one location. If you use this app then you can “Favorite” 1Wayswim and that is an easy way to see all of the content I produce. If you do use the Apple News service be sure to “Love” my articles so that Apple News will suggest my content to other users. Facebook is a great way to keep in touch with family members that don’t keep in touch with you in any other way, but because Facebook controls everything about its service it is not the best choice for you the content consumer. If you ultimately want to decide what content to consume I suggest you use an alternative method to get the content you want to read. 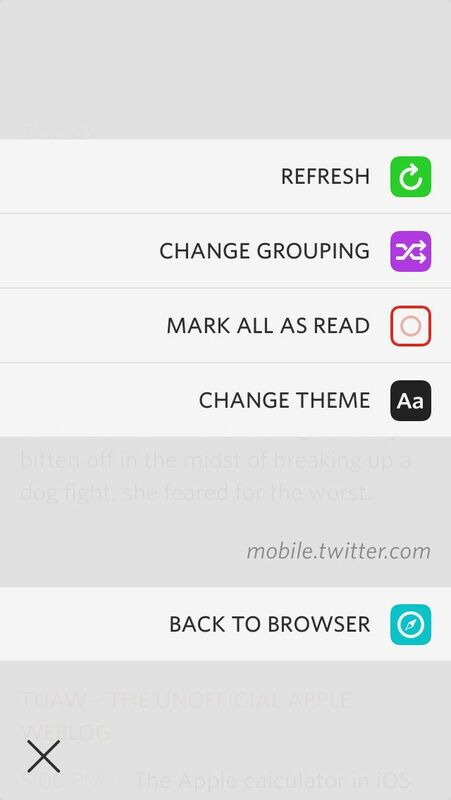 Unread is an iOS RSS reader app developed by Jared Sinclair. As an RSS newsreader it works with Feedly, FeedWrangler, and Feedbin. Not long after installing the app I made a pretty big mistake by selecting ALL of my news articles and marking them as "read". Needless to say that is not what I wanted to do. In the end it was my mistake because the app even gave me a warning message asking me to confirm that I really wanted to mark everything as read. So I posted a question about what I did to twitter and App.net and within just a few minutes I got a response back from Jared. You just don't get customer service like that anymore...thanks Jared! I know that I have a wide variety of people that read my blog and not everyone knows what RSS is. RSS stands for Rich Site Summary but is most commonly called or known as Really Simple Syndication. In non-technical terms RSS is a way for people that publish things on the web (like news articles and headlines, blog posts, audio and video podcasts and video podcasts) to have those publications "pushed" our to people that have signed up (or subscribed) to that content. Before RSS people had to either regularly visit their favorite websites to see if any new content had been posted or sign up for email updates. RSS simplifies this process by automatically delivering the content you want directly to you as soon as it is published. There are many types of RSS reading applications out there for both your portable devices and your home computer. In fact, if you are using a Mac the email client that comes installed on your Mac has an RSS reader built right in. Apple has an article that walks you through how to use the RSS feature in Apple mail here. (CORRECTION: Thanks to @BobRudge on Twitter for correcting me on this. Starting with Mountain Lion Apple is no longer including an RSS reader as part of the Mail.app application that comes with the Mac. If you are still running Lion or an earlier operating system then you have an RSS reader built-in. There are lots of 3rd party RSS reader applications out there in the Mac App Store, so if you are running Mountain Lion or later then check one of those out. I used Reeder for quite some time on my Mac.) I give my readers multiple options for signing up for being automatically updated when I publish new content here on 1wayswim. My Subscribe page has an RSS button that when pushed opens up an RSS reader application on your device (if you have one) and gives you the option to add my RSS feed to your RSS reader. For those that don't have an RSS reader I also have an option for people to sign up for email notifications each time I publish a new post. I use the Google service called FeedBurner for email notifications and I do have a handful of readers that choose this option. That's enough about RSS. If you want to know more about RSS and how to use it Pro Blogger has a great article about RSS and the problems it solves for its users. I subscribe to RSS feeds using Feedly. I transitioned to Feedly after Google Reader was killed off and have been pretty happy with it. Right now Unread is iPhone only, no iPad app but that is in the works. In fact, Jared has posted a great video to Vimeo that walks you through his design process for the iPad app that is currently in development. I use Unread to quickly scan through my feed while standing in line at the grocery store, at airport security or while waiting on my kids. If I come across an article I want to read later I push it over to Pocket. A simple swipe right to left across the screen brings up the share dialog option and when I choose share I can send the article to Pocket to read later. This helps me keep up with the various feeds that read on a regular basis so i dont have 500 articles to read when I get home. I love the clean interface of Unread. I also really like all the gesture based actions. I tend to use the app one-handed so being able to quickly use a swipe gesture to navigate is a really important feature for me. The reason for having gestures is to eliminate or reduce the need for buttons in the interface. Jared has done a great job with this app in removing all the unnecessary clutter from the app so there is nothing between you and the text you want to read...elegantly simple. I also like to scan through my feeds and only read the articles that peak my interest. Sometimes I only have a few minutes and I'll scan through a few dozen articles that I want to mark as read. All you need to do with Unread is hold and press the current article you are on and it brings up a dialog to mark all above the current article as read. I use this feature all the time. You can also just scan a given feed or category and when you are done scanning you can mark all as read. I use Buffer to share articles I like on Twitter and App.net and as of this writing Unread does not have Buffer integration. Since I do most of RSS reading on my iPad using Mr. Reader which does have Buffer integration I don't mind. When I come across an article I want to share via Buffer on my iPhone in Unread I either copy the link and use the Buffer app on my iPhone or I leave the article as "unread" and send it to Buffer when I read the article on my iPad using Mr. Reader. I really hope that when Jared releases Unread to the iPad that he adds in Buffer integration. For me, I can see Unread for the iPad replacing Mr. Reader. I really love the simplicity of this app. It put almost nothing between you and the text you want to read and makes it really easy to very quickly browse through your RSS feeds. There are A TON of RSS reader apps out there for iOS but I would argue that there is not a better app when it comes to beautifully displaying your RSS feed content. I'm a sucker for simplicity and this app is all about simplicity. I wholeheartedly recommend this app. This Dialog shows up when pressing and holding an article. 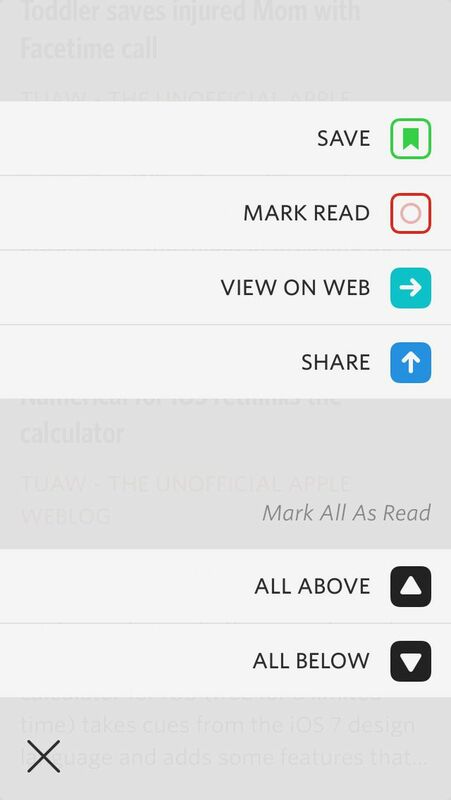 Allows you to mark "all above" or "all below" that article as "Read".